- UI: Optimize DE multiplier now doesn't use OpenCL, so works properly when OpenCL is enabled. - Shaders: Corrected algorithm for calculation of shadows opacity in IterFog mode. Now the algorithm is the same as opacity calculation in volumetric shader. - Shaders: Added option for metallic surface in material definition. It makes specular highlight in the same color as surface color. - Shaders: Implemented texture mapping based on orbit traps ('Fractalize texture' option). Not implemented in OpenCL yet. - Primitives: Added button to align primitive object rotation angle to actual camera rotation angle. - Animation: Added information about actual camera distance to selected keyframe. It is displayed in Animation dock. 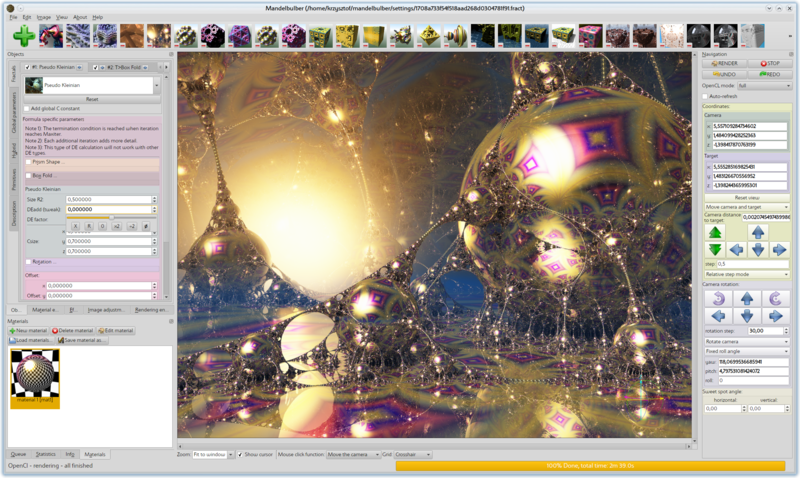 - Settings: Added reverse compatibility for mandelbulber.ini. Now older version can be run without damaging application settings. - Performance: Disabled OpenMP for updating image preview. It sometimes caused long lags at program startup or during rescaling of main window. It happened mostly when system was already loaded by another computing application. - Performance: Fixed bug causing casual freezes of image refresh and progress bar. There was direct call of cRenderedImage->update() method which is not thread safe.